Drum roll please,….. 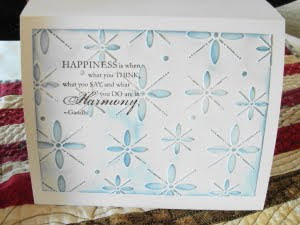 This is number three of the cards from Paper Craft magazine. 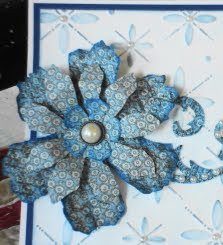 Using two Tim Holtz die’s and some Elmer’s Craft Bond, cotton fabric, seed pearls and distressed ink will get you started on making this card. 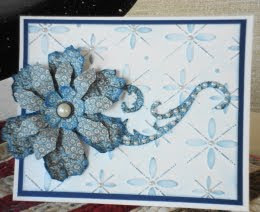 The embossing folder is from Sizzix, I have added small pearls to the center of the flowers. The inside is just repeating the front. Lovely Vada, did you have these published? if so a big CONGRATS to you!! !